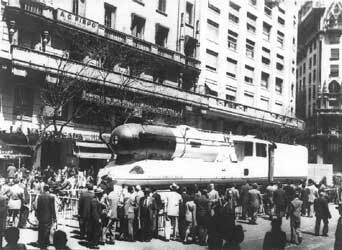 In 1948 a ground breaking locomotive project was starting to come together in Argentina. Steam may have been dying out in North America but the rest of the world was still experimenting with diesel traction. One man had a vision of what the steam could and should have been at that time and set out to show the world. That man was the now legendary Ing. L.D.Porta (1922-2003) and the locomotive was a metre gauge 4-8-0 4 cylinder compound that even today holds a series of world records. 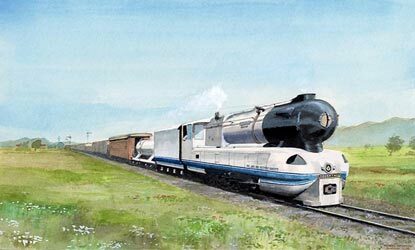 This exceptional locomotive has since become known to the world as 'Argentina'. A colourised from when the loco was on test, date uncertain. The man is Gino Margutti who was one of the engineering team. He is still alive! Juan Carlos Gonzalez Collection. Porta was without doubt one of the exceptional men of his generation. Having gained a degree as a Civil Engineer (at this time mechanical engineering was not available in Argentine universities) he went on to teach himself thermodynamics and several European languages so as to aid his ability to develop the steam locomotive. It should also be mentioned he was a qualified locomotive fireman and driver (engineer). As had been the case with Frenchman André Chapelon from the footplate Porta saw what could and should have been done. 'Argentina' was his first example. At this time Perón was in power and he was very keen on projects which were technologically advanced. Porta’s locomotive plan was the right sort of scheme at the right time. Having met with Perón to secure the finance, via the state development bank, Porta and his team set about rebuilding 1906 built metre gauge Class B22 4-6-2 No.2011 at a small workshop within the port complex in the city of Rosario to the north west of Buenos Aires. 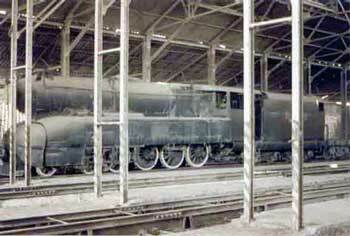 Over the next 18 months the two cylinder Pacific was turned into something very different – a 4 cylinder compound 4-8-0. In converting a 4-6-2 into a 4-8-0 Porta was following in Chapelon’s footsteps. Chapelon is still perhaps best known for his world beating 4-6-2 to 4-8-0 conversions which fell into the 240.700 and 240P classes. On test ‘Argentina’ was to match one of the 240P’s claims to fame. On display on Roque Saenz Peña avenue, Buenos Aires, outside the bank which funded the project, in 1950. Juan Carlos Gonzalez Collection. The B22 donated sections of frames, wheelsets and other items such as fittings but the cylinders, boiler and superstructure were all brand new. The tender was reused is modified form. By making use of the then modern techniques of welding and substantial use of mild steel sheets the construction was both cheaper than traditional ways and also somewhat faster. Interestingly even the four cylinders (two high pressure cylinders between the frames and the two low pressure cylinders either side of the frames) were fabricated instead of cast. The boiler was also very progressive. The boiler was steel and all welded with the exception of the main barrel seam which was riveted. At this time outside of the USA welded boiler components were still comparatively rare. It was not only in the means of construction that ‘Argentina’ was notable. The boiler pressure was 285psi, high degree superheat ensured the high pressure cylinders could receive steam at up to 842°F. Exhaust steam from the high pressure cylinders did not go direct to the low pressure cylinders’ receivers. Rather it was routed into a re-superheater which gave peak steam temperatures of 602° F in the receivers. To make maximum use of the energy in the steam the cross-sectional area of all steam pipes was increased by even greater amounts than recommended by Chapelon and port areas in the cylinders were equal to 25% of the piston area thus ensuring a locomotive with excellent “breathing” characteristics and minimal back pressure. Section of the loco’s general arrangement diagram. Tren Rodante Collection, Buenos Aires. The firebox contained 5 “T” security circulators and a lengthy brick arch. However, more revolutionary was the first serious attempt at introducing a Gas Producer Combustion System (GPCS.) 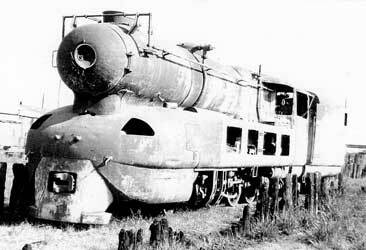 Whilst the system fitted to ‘Argentina’ was only an early experiment with GPCS the fundamentals were already there in the form of over-fire air holes in the firebox sides and backhead. Also essential for the correct functioning of a GPCS is a thick firebed which was provided for even with the firebox sitting entirely above the frames. 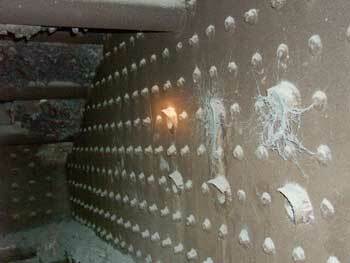 A view showing six of the over fire air holes for the Gas Producer Combustion System and also some of the “T” security circulators, October 14, 2004. Copyright © Martyn Bane. As can be imagined being a metre gauge machine there was not much room between the frames for lots of valve motion. Had it been possible to fit in all the gear required it is debatable whether there would have been any room to allow anyone in for oiling or maintenance purposes! So Porta employed a novel system. 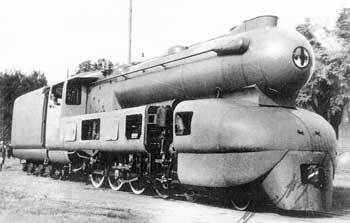 Remembering that the high and low pressure sides of compound locomotives need to run at different cut-offs for efficient working it was not just a simple case of being able to derive motion from the outside to the inside cylinders. 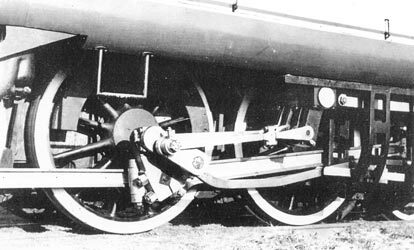 The locomotive was equipped with four sets of Walschaerts valve gear setup so that the eccentric crank drove two eccentric rods on each side. This in turn drove two separate expansion links with one providing drive to the outside cylinder’s piston valves in the traditional manner and the inner of the two on each side driving the inside cylinder’s piston valves via a series of extra linkages. A 1949 shot showing the interesting “double” valve gear arrangement. The inner expansion link drove the inner cylinder valves. Richard Campbell Collection. To finish off this revolutionary machine Porta gave ‘Argentina’ a unique styling. To reduce aerodynamic drag to a minimum the locomotive was fully streamlined which included valances over the top section of motion thus also hiding much of the kit mounted on top of the frames underneath the high pitched boiler. To accompany the radical styling ‘Argentina’ was painted in the colours of the Argentine national flag – thus the loco was white with sky blue stripes low down on each side. She must have turned many a head when running! Whilst today the locomotive is referred to as ‘Argentina’ she only really gained that name in 1955 after Perón's fall from power. When built she was named ‘Presidente Perón’ but bore a plate on the very front proclaiming ‘Argentina’. It is interesting to note that Porta was forced to have the ‘Presidente Perón’ plates made up at his own expense!! Loco on test on the Rosario docks system in 1949. Tren Rodante Collection, Buenos Aires. On test many heavy loose-coupled freight trains (that is the loco and the caboose were the only vehicles with brakes it was possible to apply whilst in motion) were hauled, the locomotive really showed it’s abilities. Loads of up to 2000tons were hauled with ease and with lighter trains top speeds were limited by the track condition not the locomotive! For many of the runs Porta was assisted by none other than Chapelon who can be seen on 16mm cine film looking most impressed. The results from the testing were outstanding by any standards but all the more so when it is considered this was Porta’s first. ‘Argentina’ was able to produce 2120drawbar horsepower which equated to 31hp/ton of loco, thus matching the world record held by the Chapelon 4-8-0 240P5. Just 1.78lb of coal were consumed per drawbar horsepower hour which beat all previous records. ‘Argentina’ gave an almost revolutionary thermal efficiency of 11.9% which was actually measured at a sub-optimal point with 13% being estimated as peak efficiency. Most contemporary locomotives struggled to reach high single figures of thermal efficiency. ‘Argentina’ dumped in La Plata yard sometime in the early 1970’s. Copyright © Richard Campbell. Once the testing was completed ‘Argentina’ settled down into regularly hauling freight services to the south west of Buenos Aires. Despite the overwhelming technical success of the loco, ‘Argentina’ was destined to remain as a one-off. As with any such loco it can be expected she would have a short life. When withdrawn in the early 1960s she had run approximately 70,000 km. Fortunately she has escaped the cutters torch. After many years of storage in Buenos Aires province 'Argentina' was moved to Tucumán province in north-west Argentina. 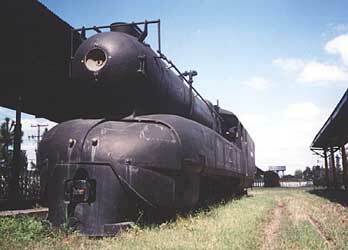 Ultimately she was placed on museum display at a closed station in Tucumán city. On display in the short lived museum in Tucumán in 2000. The museum was formerly the station ‘Tucumán Norte’. Copyright © Alberto Dieguez. The author first read about the loco in 1998 in David Wardale's book 'The Red Devil and Other Tales from the Age of Steam'. Subsequent investigations confirmed the loco was still in existence so a plan was put together to find 'Argentina'. Following a visit to 'The Train at the End of the World' in Ushuaia at the southern tip of Argentina investigations revealed where the loco was. It turned out that the museum had had a short life. 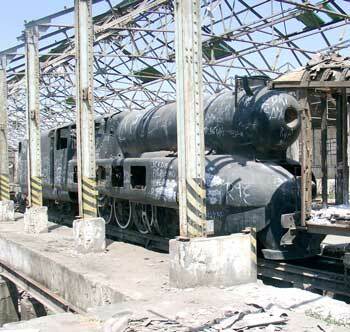 Following the economic crash of 2001 ‘Argentina’ was moved again with the closure of the museum; this time she traveled the few kilometres to the disused depot at Mate de Luna within the city of Tucumán. It is here she remains to this day. 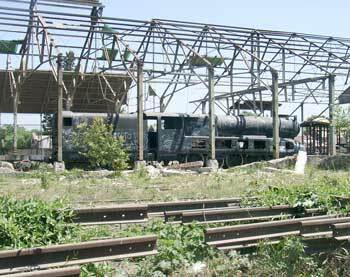 A view of the loco at Mate de Luna depot in June 2003 when there was a lot more of the depot and the loco remaining. Copyright © J. Nicolo. In October 2004 the author, accompanied by Porta’s youngest son Alejandro and several other interested parties, visited Mate de Luna to inspect the loco and assess options to move her back to Buenos Aries, this time by road. Many parts of the loco have been stolen in the last 18 months and it is to be wondered how long it will be before there is nothing left. Mate de Luna is not the safest district of Tucumán so we were very pleased to have local guidance on the day of out visit. In the end only 30 minutes or so were spent with the engine. But this time underlined just what a special machine 'Argentina' is. 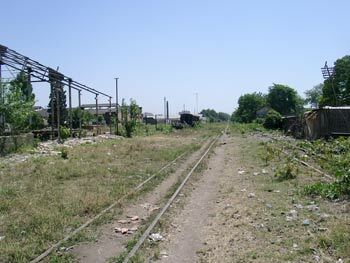 The railway around Mate de Luna depot is disused but still in place, October 14, 2004. Copyright © Martyn Bane. 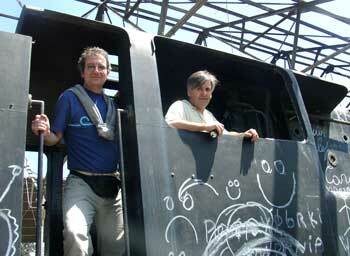 Alejandro Porta (left) and Ed Zarzoso on ‘Argentina’, October 14, 2004. Copyright © Martyn Bane. During the same trip and subsequently arrangements have been made so all that is now required to provide this most historic of locomotives with a safe future in a secure is the sum of approximately $19,000. As will be appreciated, this is a tiny sum when viewed against the millions poured into preservation around the world every year and how many of those pounds spent can be claimed to be spent on such a historic project? A general view of ‘Argentina’ showing how many bits have disappeared compared to the 2000 and 2003 shots. Mate de Luna depot, October 14, 2004. Copyright © Martyn Bane. A side view of ‘Argentina’ at Mate de Luna depot, October 14, 2004. Copyright © Martyn Bane. Part of the streamlining, which had been loose for ages, has been stolen revealing some of the inner workings. Mate de Luna depot, October 14, 2004. Copyright © Martyn Bane. Ultimately it is hoped to return 'Argentina' to service as a demonstrator of Porta's technology with the loco brought right up to date with the latest steam engine technology. What greater tribute to Ing Porta could there be? US based donors should also be aware that John Johnston is matching donations from the USA on a dollar for dollar basis thus doubling the value of individual contributions. Full details of John's offer can be found here http://www.martynbane.co.uk/fundnews.htm#jj. Shown above is a technically accurate depiction of the narrow-gauge steam freight locomotive 'Argentina', a technological masterpiece executed by Ing. L.D.Porta, an André Chapelon protégée. 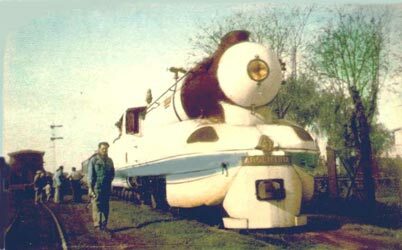 This one of a kind streamlined engine served the railways of Argentina from the late 1940s into the 1960s before being retired, and left to an uncertain fate. Long thought to have been scrapped, this unique relic of the steam age was recently discovered to still be in existence, albeit rapidly falling prey to the elements, vandals and scrap metal thieves. 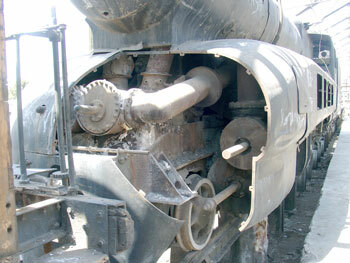 There is now an effort in work to save and restore the locomotive. Read the whole story, including what you can do to help save the engine, in Martyn Bane's fascinating article Saving Argentina. Painting copyright © Robin Barnes.